ANA Synchro: How did you get involved with ANA Synchro? Alice Rodgers: My friend Caitlyn, who was already on the team, brought me to “Bring a Friend to Synchro Day” when we were both in third grade. At the time, I did swim lessons and dance. I didn’t really like dance, but I loved the music. The music was the most fun. So when I tried synchro, I remember being in the pool and thinking, “they get to dance to the music??! !” I came to the show that year, and I was enamored. I felt I really needed to try this. 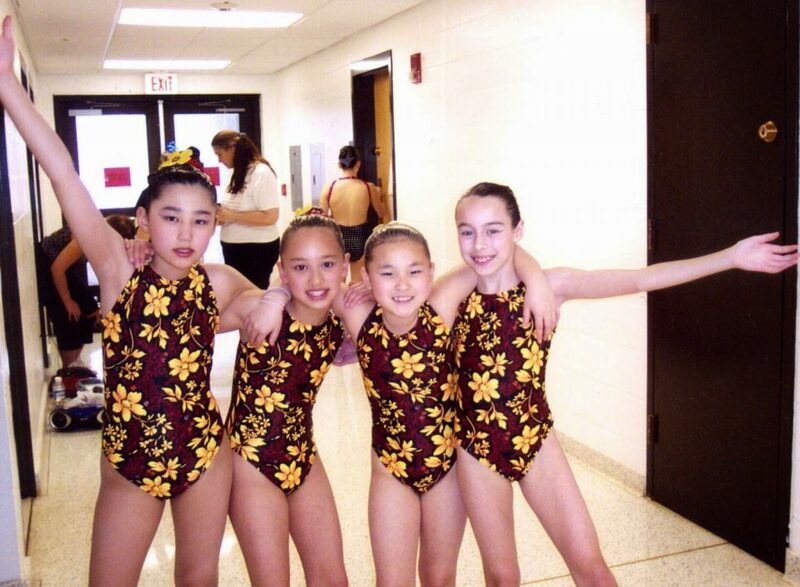 Alice (far right) with some "friends" at the beginning of her synchro career, including another recent alum, Laina Gray, second from left! ANA Synchro: What do you remember from your first year? Alice Rodgers: I tried out for novice, and we swam to “Joseph and the Amazing Technicolor Dreamcoat!” And I remember being in the show that first year. My most vivid memory is from the rehearsal. I remember the lights going off in the pool, and I was shocked! I didn't know they could do that! I wasn't sure if I should open my eyes underwater because it was pitch black. It was so scary, but it was so much fun too. I remember thinking, "Wow! This is so intense! This is awesome! I want to do this!" And then the next year I swam with the Intermediates, and we swam to “Jungle Book”. It was great! ANA Synchro: What would you tell young girls (and their parents) who are considering synchro as a sport? Alice Rodgers: Synchro has just the same amount of struggle and strife, (and drama sometimes! ), as any other sport. For me, lifelong friendships is the coolest thing I got out of this sport. I'm sure lots of sports contribute to your daughter's ability to build and maintain lifelong friendships, but I did not have literal sisters until I came to this team. And I have left with people that I view as siblings in a way I couldn’t possibly comprehend. Even after synchro they are still my closest friends. We’re also not internally competitive as some other sports because you really do have to swim all together, requiring a unique kind of teamwork. The common goal is to succeed, and, to do that, everyone has to be as one to be able to do the same thing in the water. And there is something that is so weird and special about breathing at the exact same time as seven other girls to music. You wouldn’t think it because it sounds just weird, but after a certain while, when you realize you are doing it, you say to yourself, “Wow! That's eight human beings who are taking their breath, which is the most important thing we do consciously, at the same time.” That's pretty crazy. Alice (standing, middle-right) with her "sisters" in one of her final team performances at the annual show. Alice Rodgers: ANA Synchro has improved as a team so much since my first year as a novice. The girls I’m coaching today are so much better, I think, than we ever were! I remember going to our first nationals and seeing the caliber of teams from the west coast, and that made us want to work so much harder. We were so determined after that. And, two years later, we made finals at nationals for the first time, and that was a huge deal. I look at the most successful girls on the team, and there’s a certain amount of natural talent there. But I don’t believe for a second that anyone without the natural talent can’t achieve the exact same thing provided she’s working extremely hard for it. The really young girls who come to our team who did gymnastics or dance and already have their splits, for example, can just come here and maintain that flexibility. I only got my split down for the first time in my whole life as a junior in high school. That’s very, very unusual. But I got my split that year because I was on the senior team and I desperately, desperately wanted it. So, to the girls, I would say that your ability to improve drastically in this sport is completely determined by your willingness to work for it – 100% willingness. Of course, it's not enough to just want something; you have to have someone to show you the path to get there. And, with Head Coach Leah Pinette, we have a great person to show us! Please Email us at synchroana@gmail.com for more information about our next“Bring-A-Friend” Day. ← Youth Development – a Focus for ANA Synchro and the Y!